Collection of glass milk bottles was an expense for local milk producers and often these costly bottles were not returned by customers. In the early 1900s many milk bottles were reclaimed from city dumps and returned to milk bottle exchanges for reuse. In 1912 a Boston milk bottle exchange recovered 490,978 bottles from dump operators! Shortly after inventor Dr. Wilbur L. Wright (along with his patented waxed cone) joined Sealright Company of New York, the company introduced in 1921 the first milk container made entirely of paper and trademarked as the Sealright Kone. The Thatcher Farm single service half pint Sealright Kone above comes with a warning that there is a 'PENALTY FOR REUSE TWENTY-FIVE DOLLARS.' The waxed cone, which contains a metal lip, is missing its original milk cap. 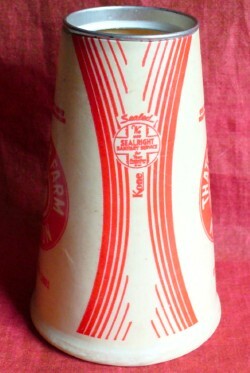 The cone most likely dates from the 1930s when Sealright advertised the 'Kone' for delivering milk to schools and other places where bottle breakage was high and bottle collection difficult. Since these waxed containers were designed to be thrown away, few examples survive today. 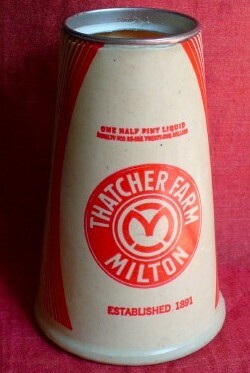 The Thatcher Farm cone above was found at a yard sale by donor Robert Gomes for twenty-five cents.